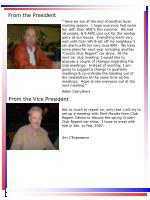 Not to much to report on, only that I will try to set up a meeting with Mort Moodle from Club Regent Casino to discuss the spring Cruisin Club Regent car show. 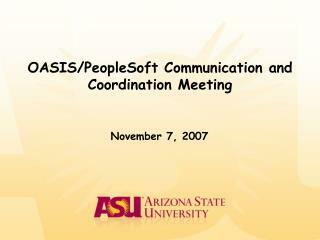 I hope to meet with him in Jan. or Feb. 2007. Very late getting this one out, I thought it would be easy since it features my car but? Anyways this issue features 2 great cars and a good tech article I hope you will find useful. 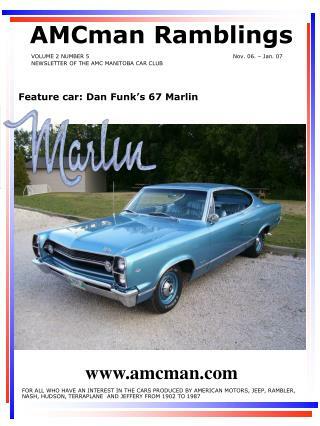 Coming up in the next issue I hope to feature Dan Funk’s 67 Marlin. To be eligible for membership, all you have to be is a true AMC enthusiast. Ownership of an AMC is not required. 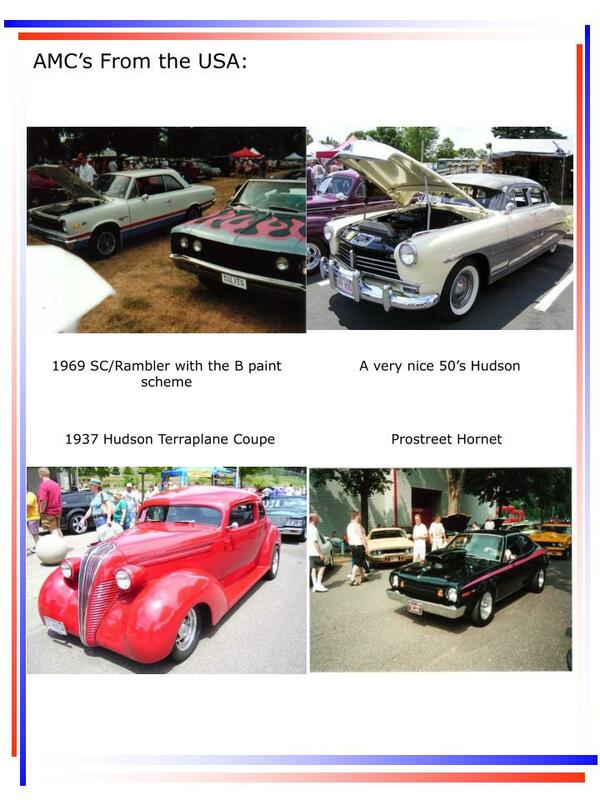 All American Motors, Jeep, Rambler, Nash, Hudson and Jeffery models from 1902 to 1987 are recognized by the club. 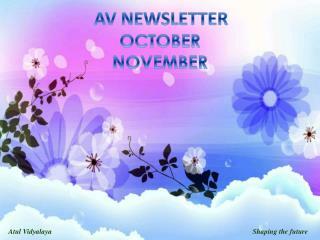 Members will be added to a group e-mail and will receive a quarterly newsletter in the mail. 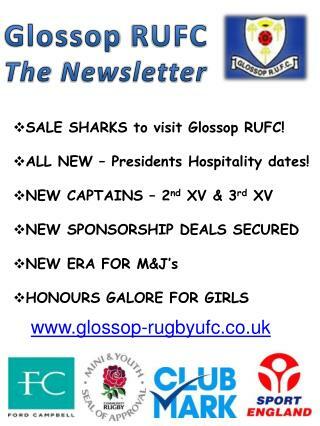 Club event announcements will be sent out via e-mail and printed in the newsletter. 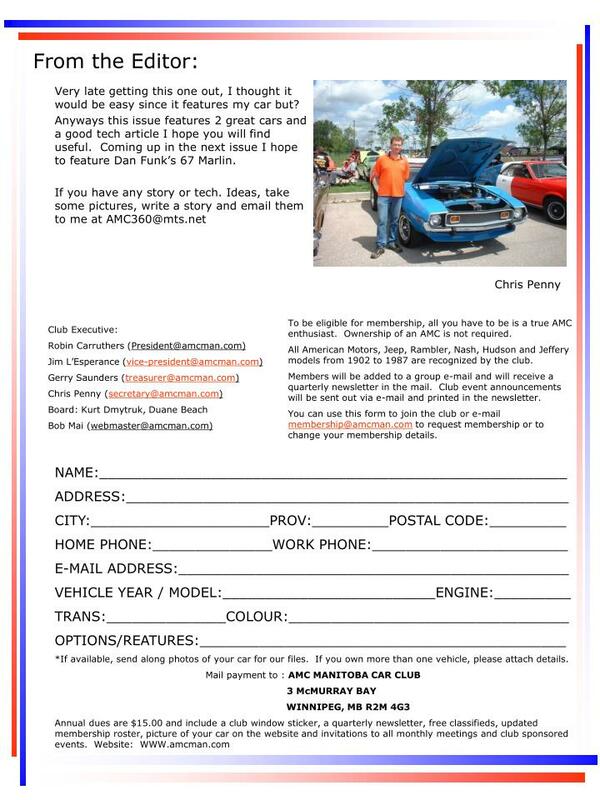 You can use this form to join the club or e-mail membership@amcman.com to request membership or to change your membership details. 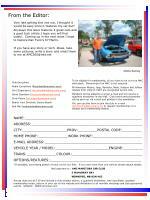 *If available, send along photos of your car for our files. 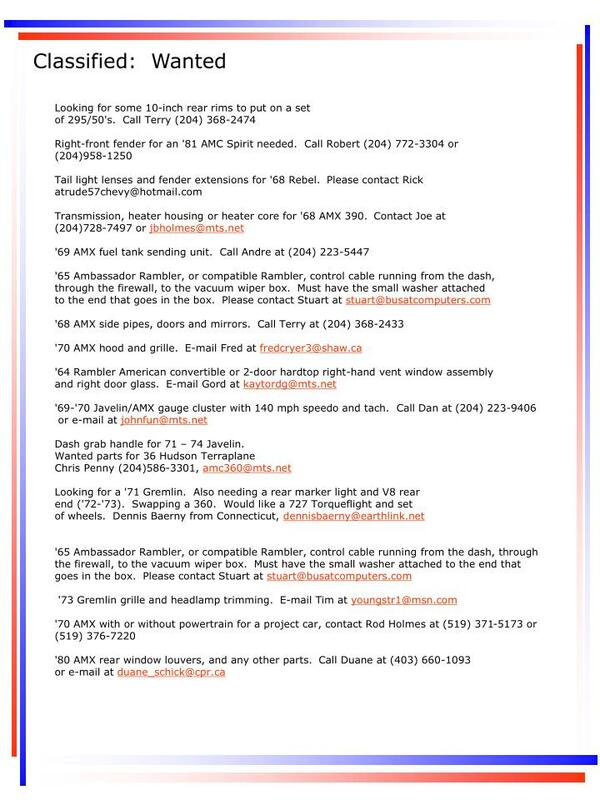 If you own more than one vehicle, please attach details. American Motors has struggled to create a new sporting image. The old economy look their cars carried a few years back created cobwebs of disinterest among the car-buyers, except maybe at Sun City Motors. 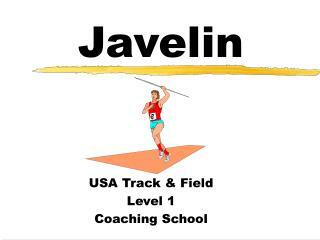 So, with the introduction of Javelin in 1968, the image change was underway. 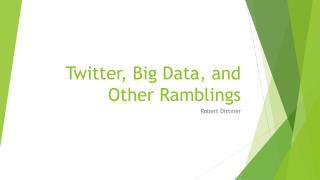 When Rambler was pronounced dead in 1969, the cycle was complete. Despite major facelifts throughout the American Motors line in those years, it was the Javelin and AMX models that made the impact and helped AMX to a good sales year in 1970. 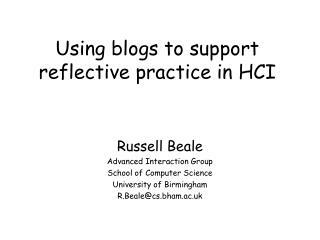 Then – wouldn’t you know it? 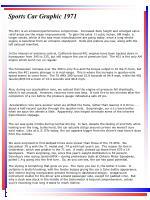 – the nation reverted to economy cars again. Exit Javelin/AMX . . . Soon. To bad. 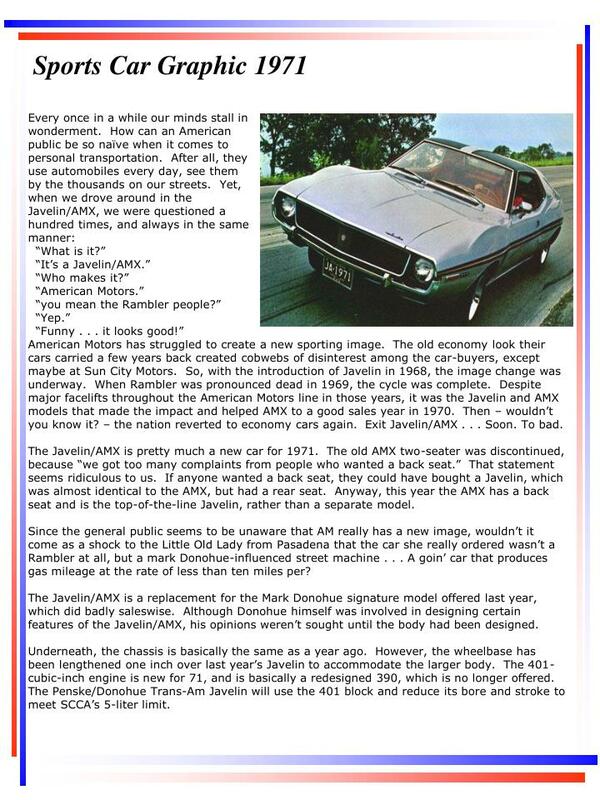 The Javelin/AMX is pretty much a new car for 1971. The old AMX two-seater was discontinued, because “we got too many complaints from people who wanted a back seat.” That statement seems ridiculous to us. If anyone wanted a back seat, they could have bought a Javelin, which was almost identical to the AMX, but had a rear seat. Anyway, this year the AMX has a back seat and is the top-of-the-line Javelin, rather than a separate model. Since the general public seems to be unaware that AM really has a new image, wouldn’t it come as a shock to the Little Old Lady from Pasadena that the car she really ordered wasn’t a Rambler at all, but a mark Donohue-influenced street machine . 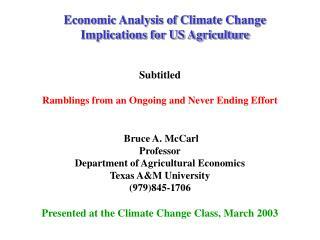 . . A goin’ car that produces gas mileage at the rate of less than ten miles per? The Javelin/AMX is a replacement for the Mark Donohue signature model offered last year, which did badly saleswise. Although Donohue himself was involved in designing certain features of the Javelin/AMX, his opinions weren’t sought until the body had been designed. Underneath, the chassis is basically the same as a year ago. However, the wheelbase has been lengthened one inch over last year’s Javelin to accommodate the larger body. The 401-cubic-inch engine is new for 71, and is basically a redesigned 390, which is no longer offered. 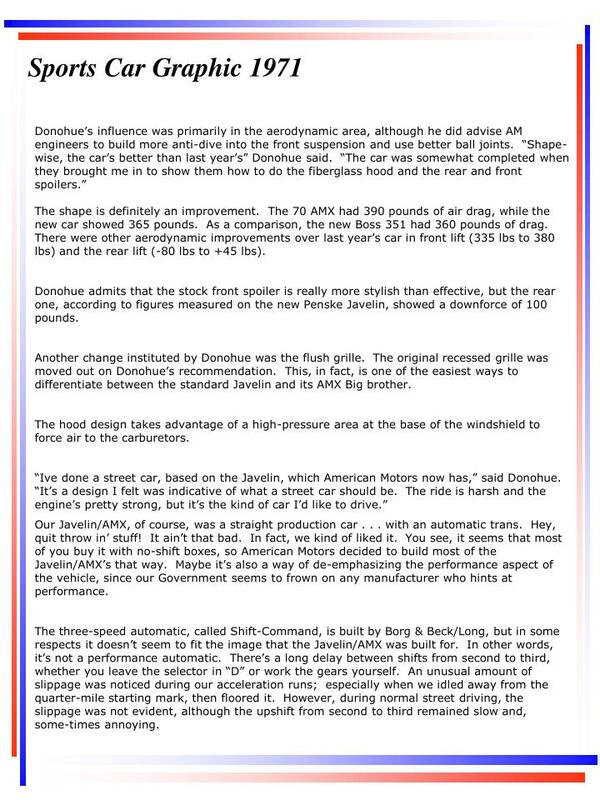 The Penske/Donohue Trans-Am Javelin will use the 401 block and reduce its bore and stroke to meet SCCA’s 5-liter limit. Donohue’s influence was primarily in the aerodynamic area, although he did advise AM engineers to build more anti-dive into the front suspension and use better ball joints. “Shape-wise, the car’s better than last year’s” Donohue said. “The car was somewhat completed when they brought me in to show them how to do the fiberglass hood and the rear and front spoilers.”The shape is definitely an improvement. 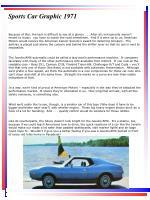 The 70 AMX had 390 pounds of air drag, while the new car showed 365 pounds. As a comparison, the new Boss 351 had 360 pounds of drag. There were other aerodynamic improvements over last year’s car in front lift (335 lbs to 380 lbs) and the rear lift (-80 lbs to +45 lbs). Donohue admits that the stock front spoiler is really more stylish than effective, but the rear one, according to figures measured on the new Penske Javelin, showed a downforce of 100 pounds. Another change instituted by Donohue was the flush grille. The original recessed grille was moved out on Donohue’s recommendation. This, in fact, is one of the easiest ways to differentiate between the standard Javelin and its AMX Big brother. The hood design takes advantage of a high-pressure area at the base of the windshield to force air to the carburetors. 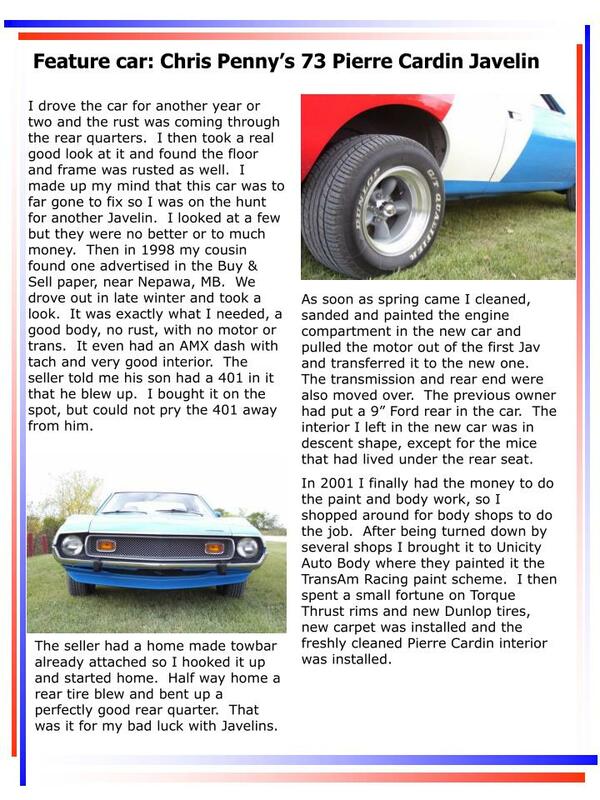 Our Javelin/AMX, of course, was a straight production car . 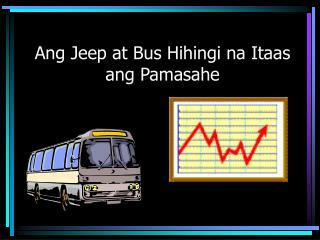 . . with an automatic trans. Hey, quit throw in’ stuff! It ain’t that bad. In fact, we kind of liked it. You see, it seems that most of you buy it with no-shift boxes, so American Motors decided to build most of the Javelin/AMX’s that way. Maybe it’s also a way of de-emphasizing the performance aspect of the vehicle, since our Government seems to frown on any manufacturer who hints at performance. The three-speed automatic, called Shift-Command, is built by Borg & Beck/Long, but in some respects it doesn’t seem to fit the image that the Javelin/AMX was built for. 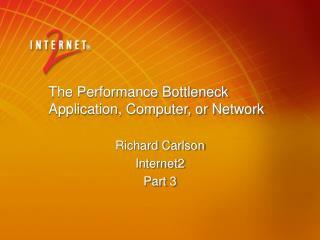 In other words, it’s not a performance automatic. There’s a long delay between shifts from second to third, whether you leave the selector in “D” or work the gears yourself. An unusual amount of slippage was noticed during our acceleration runs; especially when we idled away from the quarter-mile starting mark, then floored it. However, during normal street driving, the slippage was not evident, although the upshift from second to third remained slow and, some-times annoying. 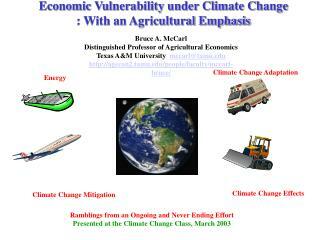 The 401 is an emission/performance compromise. Increased deck height and enlarged valve relief areas are the major improvements. To gain the extra 11 cubic inches, AM made a longer stroke, which is the way most manufacturers are going today, since a long-stroke engine is beneficial from an emission standpoint. Rods and pistons are new, along with the left exhaust manifold. In the interest of emission control, California-bound 401 engines have been backed down in horsepower from 345 to 335, but still require the use of premium fuel. The 401 is the only AM engine which won’t run on regular. The horsepower increase over the 390 is only five and the torque output is 10 lbs-ft more, but where the 401 seems stronger is in mid-range. This is where the increase in quarter-mile speed seems to come from. The 70 AMX 390 turned 15.0 seconds at 94.4 mph, while the 401 Javelin/AMX hit a mark of 14.3 seconds and 98.8 mph. Also, during our acceleration runs, we noticed that the engine oil pressure fell drastically, which is not unusual. However, recovery time was long. It took five to ten minutes after the completion of a run before the pressure gauge indicated a safe 20 psi. Acceleration runs were quicker when we shifted the trans, rather than leaving it in Drive . . . about a half second quicker through the quarter-mile. Surprisingly, our e.t.s were better when we spun the wheels a little. Apparently, this helped eliminate some of the inherent transmission slippage. The car was quite nimble during normal driving. In fact, despite the feeling of enormity while looking over the long, bulky hood, the car actually did go around corners we weren’t sure we’d make. Like all U.S. GTs today, the car appears bigger from the driver’s seat than it does from the outside. 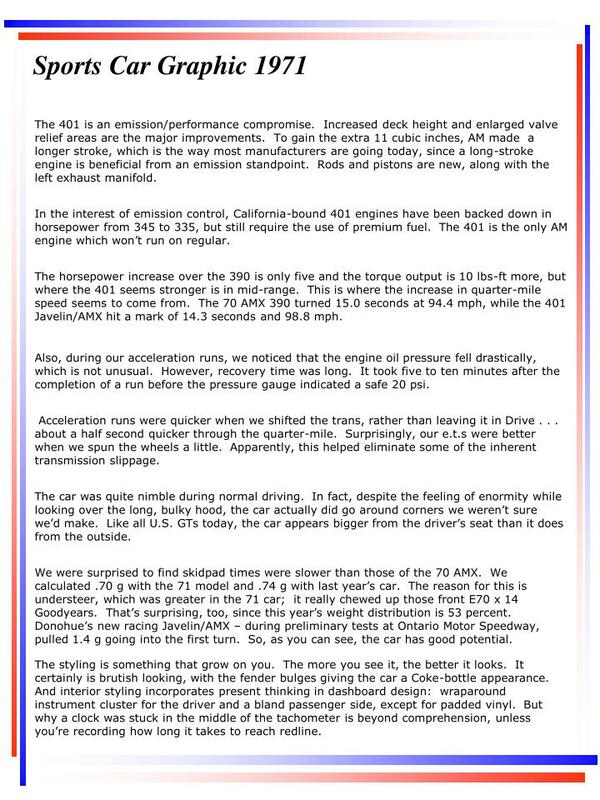 We were surprised to find skidpad times were slower than those of the 70 AMX. We calculated .70 g with the 71 model and .74 g with last year’s car. The reason for this is understeer, which was greater in the 71 car; it really chewed up those front E70 x 14 Goodyears. That’s surprising, too, since this year’s weight distribution is 53 percent. Donohue’s new racing Javelin/AMX – during preliminary tests at Ontario Motor Speedway, pulled 1.4 g going into the first turn. So, as you can see, the car has good potential. The styling is something that grow on you. The more you see it, the better it looks. It certainly is brutish looking, with the fender bulges giving the car a Coke-bottle appearance. And interior styling incorporates present thinking in dashboard design: wraparound instrument cluster for the driver and a bland passenger side, except for padded vinyl. But why a clock was stuck in the middle of the tachometer is beyond comprehension, unless you’re recording how long it takes to reach redline. Because of this, the tach is difficult to see at a glance . . . After all, instruments weren’t meant to study; you have to watch the road sometimes. And if it were up to us, American Motors would receive the American Cancer Society’s award for deterring smokers. The ashtray is placed just above the console and behind the shifter lever so that its use is next to impossible. 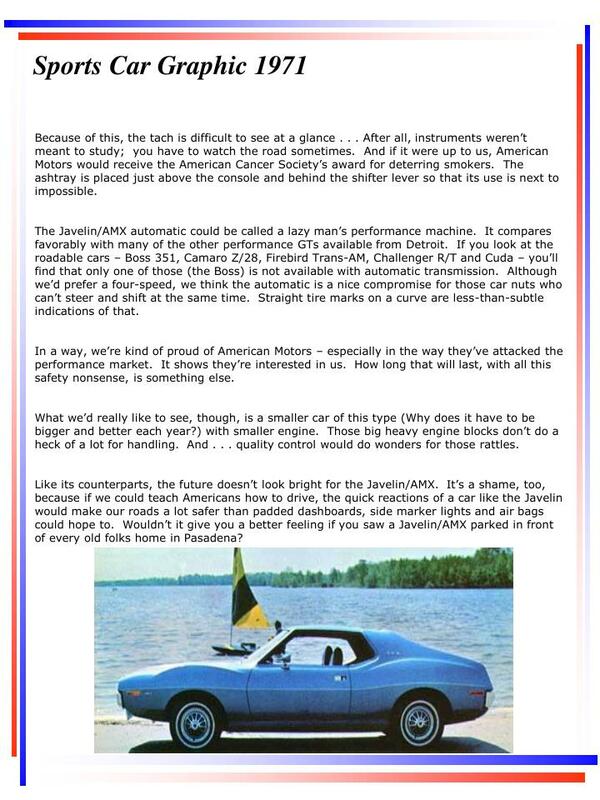 The Javelin/AMX automatic could be called a lazy man’s performance machine. It compares favorably with many of the other performance GTs available from Detroit. If you look at the roadable cars – Boss 351, Camaro Z/28, Firebird Trans-AM, Challenger R/T and Cuda – you’ll find that only one of those (the Boss) is not available with automatic transmission. Although we’d prefer a four-speed, we think the automatic is a nice compromise for those car nuts who can’t steer and shift at the same time. Straight tire marks on a curve are less-than-subtle indications of that. In a way, we’re kind of proud of American Motors – especially in the way they’ve attacked the performance market. It shows they’re interested in us. 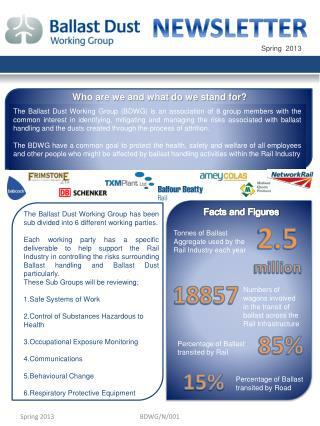 How long that will last, with all this safety nonsense, is something else. What we’d really like to see, though, is a smaller car of this type (Why does it have to be bigger and better each year?) with smaller engine. Those big heavy engine blocks don’t do a heck of a lot for handling. And . . . quality control would do wonders for those rattles. Like its counterparts, the future doesn’t look bright for the Javelin/AMX. It’s a shame, too, because if we could teach Americans how to drive, the quick reactions of a car like the Javelin would make our roads a lot safer than padded dashboards, side marker lights and air bags could hope to. Wouldn’t it give you a better feeling if you saw a Javelin/AMX parked in front of every old folks home in Pasadena? 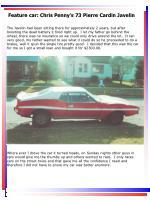 My AMC story began when I was 17, looking for a muscle car to buy. 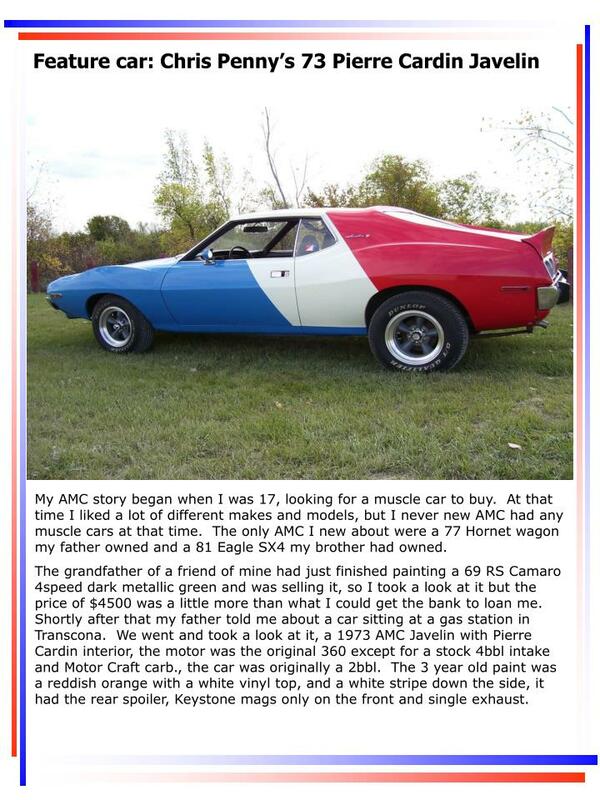 At that time I liked a lot of different makes and models, but I never new AMC had any muscle cars at that time. 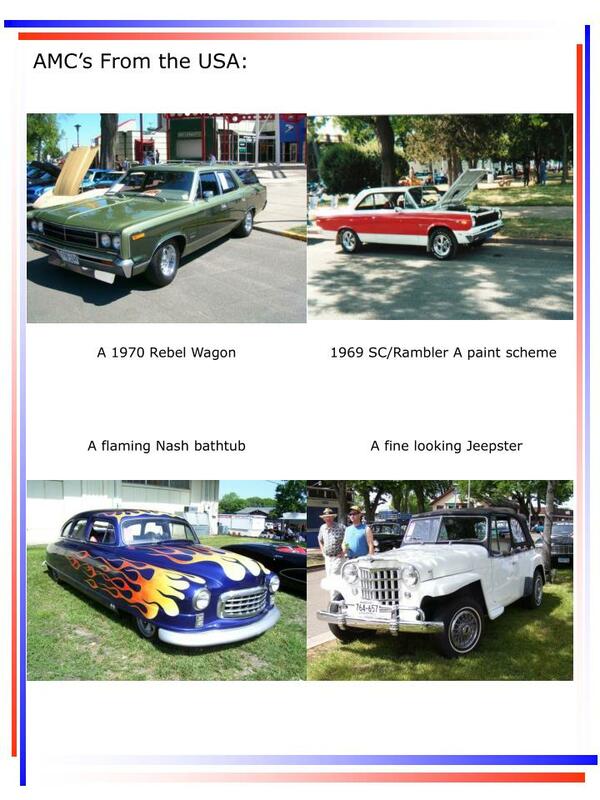 The only AMC I new about were a 77 Hornet wagon my father owned and a 81 Eagle SX4 my brother had owned. 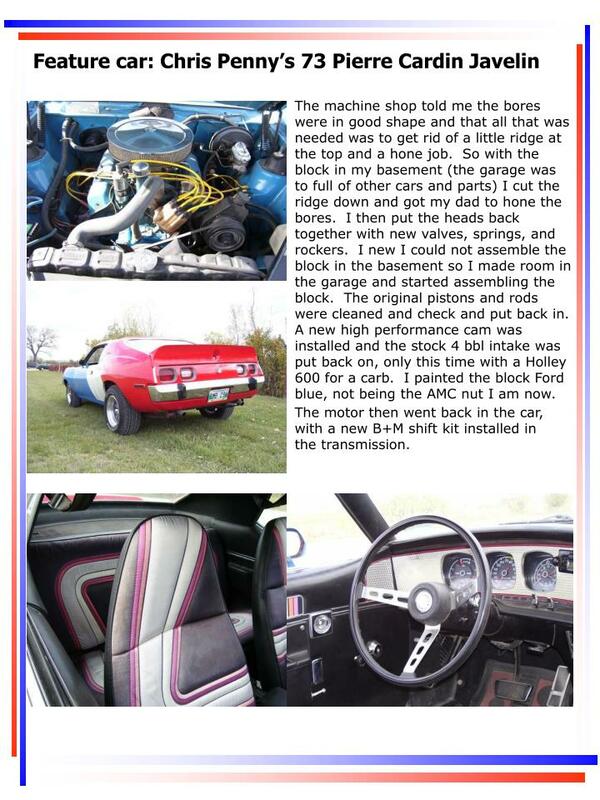 The grandfather of a friend of mine had just finished painting a 69 RS Camaro 4speed dark metallic green and was selling it, so I took a look at it but the price of $4500 was a little more than what I could get the bank to loan me. Shortly after that my father told me about a car sitting at a gas station in Transcona. We went and took a look at it, a 1973 AMC Javelin with Pierre Cardin interior, the motor was the original 360 except for a stock 4bbl intake and Motor Craft carb., the car was originally a 2bbl. 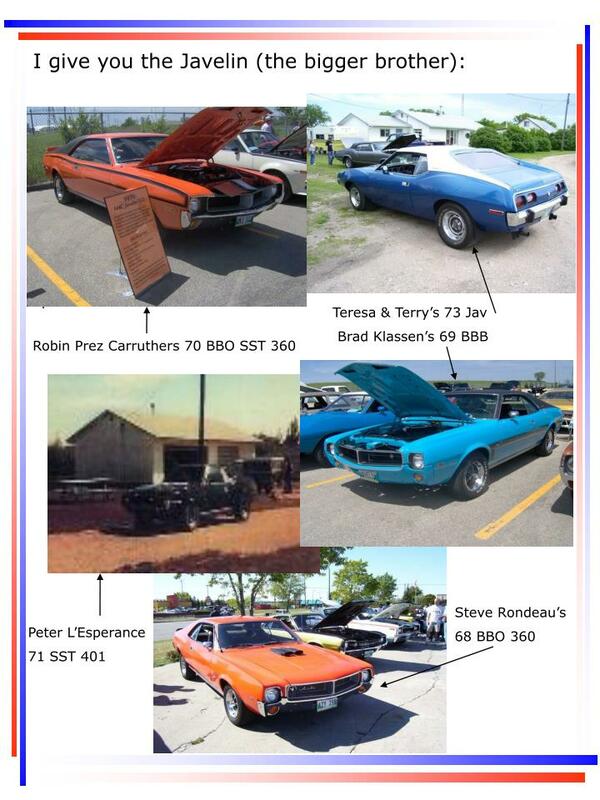 The 3 year old paint was a reddish orange with a white vinyl top, and a white stripe down the side, it had the rear spoiler, Keystone mags only on the front and single exhaust. The Javelin had been sitting there for approximately 2 years, but after boosting the dead battery it fired right up. I let my father go behind the wheel, there was no insurance so we could only drive around the lot. It ran very good, my father wanted to see what it could do so he proceeded to do a brakie, well it spun the single tire pretty good. I decided that this was the car for me so I got a small loan and bought it for $2300.00. Where ever I drove the car it turned heads, on Sunday nights other guys in cars would give me the thumbs up and others wonted to race. I only races cars on the street twice and that gave me all the confidence I need and therefore I did not have to prove my car was better anymore. I used the car for several years as a summer daily driver, just doing minor maintenance, putting dual exhaust on and a valve job. In 1990 a lady went through a red light and hit me in the passenger front wheel, crumpling the fender bending all the suspension and bending the frame! It was a right off. I liked the car so much that I bought it back from Autopack, straitened the frame, found a replacement front fender and replaced all the suspension components. I was working on a meager budget so I could not afford to get it painted, therefore I drove around with one primered fender for another 2 years. Another bad day then happened on my way to a store, a rear tire fell off a 5 ton van and took out my drivers fender. Autopack wonted to right the Jav off a second time, but I put up a fuss and told them it was a rare car and that they should compare it to other cars like it. They then agreed to fix it, with me kicking in a little extra to get the passenger fender (the first one) painted as well. 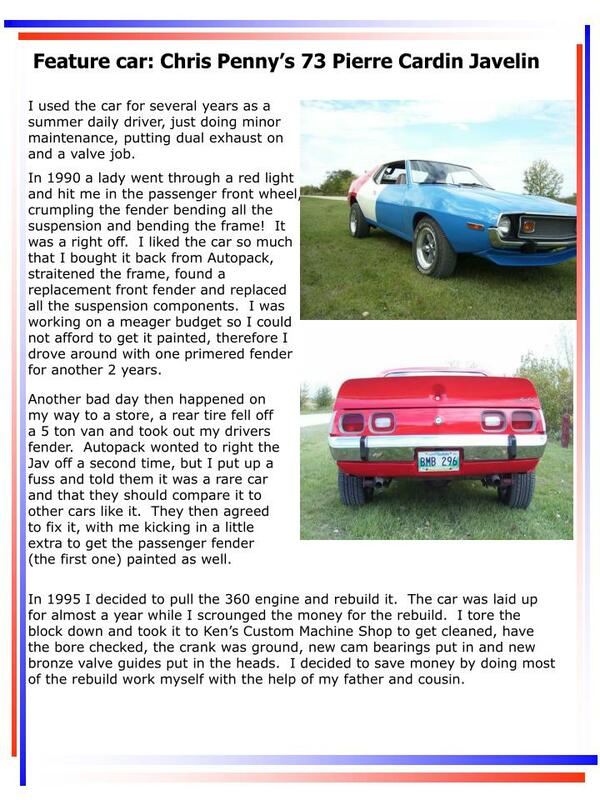 In 1995 I decided to pull the 360 engine and rebuild it. The car was laid up for almost a year while I scrounged the money for the rebuild. I tore the block down and took it to Ken’s Custom Machine Shop to get cleaned, have the bore checked, the crank was ground, new cam bearings put in and new bronze valve guides put in the heads. I decided to save money by doing most of the rebuild work myself with the help of my father and cousin. The machine shop told me the bores were in good shape and that all that was needed was to get rid of a little ridge at the top and a hone job. So with the block in my basement (the garage was to full of other cars and parts) I cut the ridge down and got my dad to hone the bores. I then put the heads back together with new valves, springs, and rockers. I new I could not assemble the block in the basement so I made room in the garage and started assembling the block. The original pistons and rods were cleaned and check and put back in. A new high performance cam was installed and the stock 4 bbl intake was put back on, only this time with a Holley 600 for a carb. I painted the block Ford blue, not being the AMC nut I am now. The motor then went back in the car, with a new B+M shift kit installed in the transmission. I drove the car for another year or two and the rust was coming through the rear quarters. I then took a real good look at it and found the floor and frame was rusted as well. 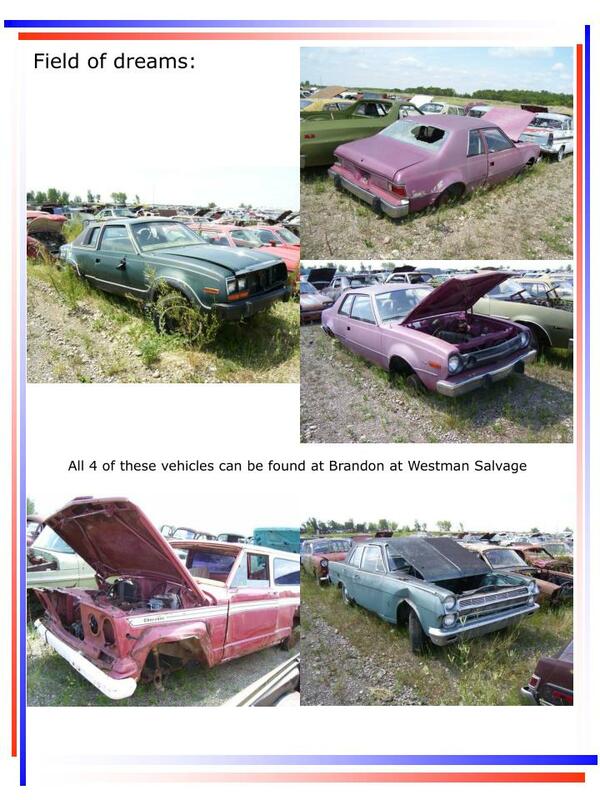 I made up my mind that this car was to far gone to fix so I was on the hunt for another Javelin. I looked at a few but they were no better or to much money. 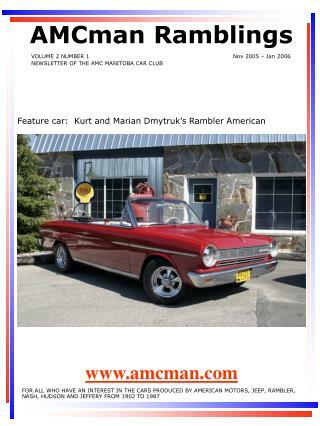 Then in 1998 my cousin found one advertised in the Buy & Sell paper, near Nepawa, MB. We drove out in late winter and took a look. It was exactly what I needed, a good body, no rust, with no motor or trans. It even had an AMX dash with tach and very good interior. The seller told me his son had a 401 in it that he blew up. I bought it on the spot, but could not pry the 401 away from him. As soon as spring came I cleaned, sanded and painted the engine compartment in the new car and pulled the motor out of the first Jav and transferred it to the new one. The transmission and rear end were also moved over. The previous owner had put a 9” Ford rear in the car. The interior I left in the new car was in descent shape, except for the mice that had lived under the rear seat. In 2001 I finally had the money to do the paint and body work, so I shopped around for body shops to do the job. After being turned down by several shops I brought it to Unicity Auto Body where they painted it the TransAm Racing paint scheme. I then spent a small fortune on Torque Thrust rims and new Dunlop tires, new carpet was installed and the freshly cleaned Pierre Cardin interior was installed. The seller had a home made towbar already attached so I hooked it up and started home. Half way home a rear tire blew and bent up a perfectly good rear quarter. That was it for my bad luck with Javelins. 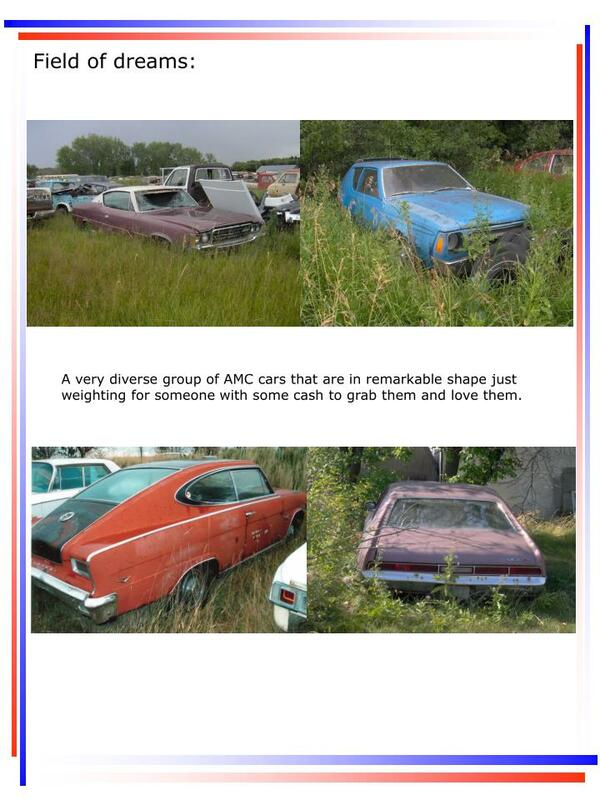 A very diverse group of AMC cars that are in remarkable shape just weighting for someone with some cash to grab them and love them. 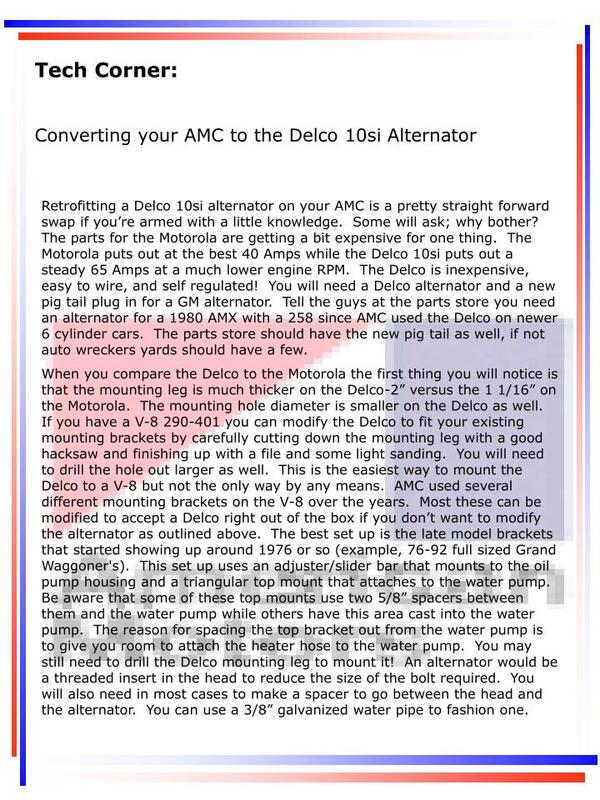 Retrofitting a Delco 10si alternator on your AMC is a pretty straight forward swap if you’re armed with a little knowledge. Some will ask; why bother? The parts for the Motorola are getting a bit expensive for one thing. The Motorola puts out at the best 40 Amps while the Delco 10si puts out a steady 65 Amps at a much lower engine RPM. The Delco is inexpensive, easy to wire, and self regulated! You will need a Delco alternator and a new pig tail plug in for a GM alternator. Tell the guys at the parts store you need an alternator for a 1980 AMX with a 258 since AMC used the Delco on newer 6 cylinder cars. The parts store should have the new pig tail as well, if not auto wreckers yards should have a few. When you compare the Delco to the Motorola the first thing you will notice is that the mounting leg is much thicker on the Delco-2” versus the 1 1/16” on the Motorola. The mounting hole diameter is smaller on the Delco as well. If you have a V-8 290-401 you can modify the Delco to fit your existing mounting brackets by carefully cutting down the mounting leg with a good hacksaw and finishing up with a file and some light sanding. You will need to drill the hole out larger as well. This is the easiest way to mount the Delco to a V-8 but not the only way by any means. AMC used several different mounting brackets on the V-8 over the years. 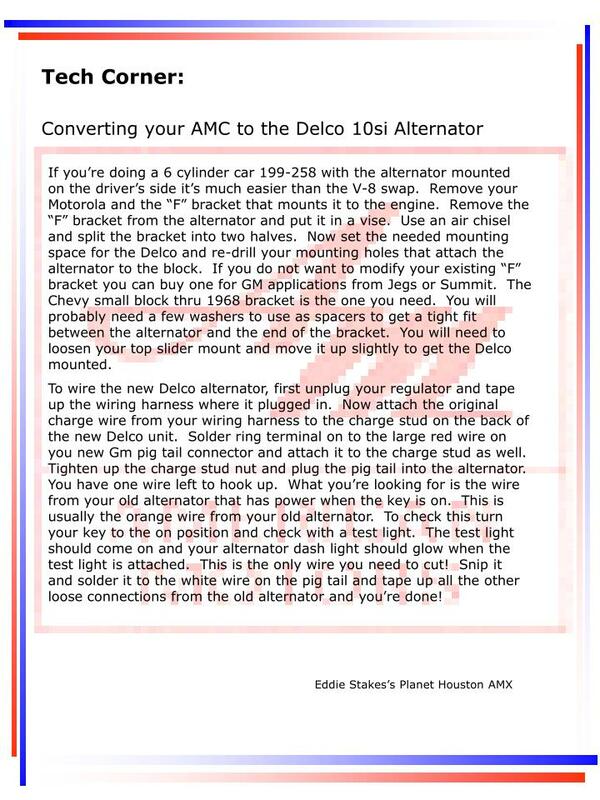 Most these can be modified to accept a Delco right out of the box if you don’t want to modify the alternator as outlined above. The best set up is the late model brackets that started showing up around 1976 or so (example, 76-92 full sized Grand Waggoner's). This set up uses an adjuster/slider bar that mounts to the oil pump housing and a triangular top mount that attaches to the water pump. Be aware that some of these top mounts use two 5/8” spacers between them and the water pump while others have this area cast into the water pump. The reason for spacing the top bracket out from the water pump is to give you room to attach the heater hose to the water pump. You may still need to drill the Delco mounting leg to mount it! An alternator would be a threaded insert in the head to reduce the size of the bolt required. You will also need in most cases to make a spacer to go between the head and the alternator. You can use a 3/8” galvanized water pipe to fashion one. If you’re doing a 6 cylinder car 199-258 with the alternator mounted on the driver’s side it’s much easier than the V-8 swap. Remove your Motorola and the “F” bracket that mounts it to the engine. Remove the “F” bracket from the alternator and put it in a vise. Use an air chisel and split the bracket into two halves. Now set the needed mounting space for the Delco and re-drill your mounting holes that attach the alternator to the block. If you do not want to modify your existing “F” bracket you can buy one for GM applications from Jegs or Summit. The Chevy small block thru 1968 bracket is the one you need. You will probably need a few washers to use as spacers to get a tight fit between the alternator and the end of the bracket. You will need to loosen your top slider mount and move it up slightly to get the Delco mounted. To wire the new Delco alternator, first unplug your regulator and tape up the wiring harness where it plugged in. Now attach the original charge wire from your wiring harness to the charge stud on the back of the new Delco unit. Solder ring terminal on to the large red wire on you new Gm pig tail connector and attach it to the charge stud as well. Tighten up the charge stud nut and plug the pig tail into the alternator. You have one wire left to hook up. What you’re looking for is the wire from your old alternator that has power when the key is on. This is usually the orange wire from your old alternator. To check this turn your key to the on position and check with a test light. The test light should come on and your alternator dash light should glow when the test light is attached. This is the only wire you need to cut! Snip it and solder it to the white wire on the pig tail and tape up all the other loose connections from the old alternator and you’re done! 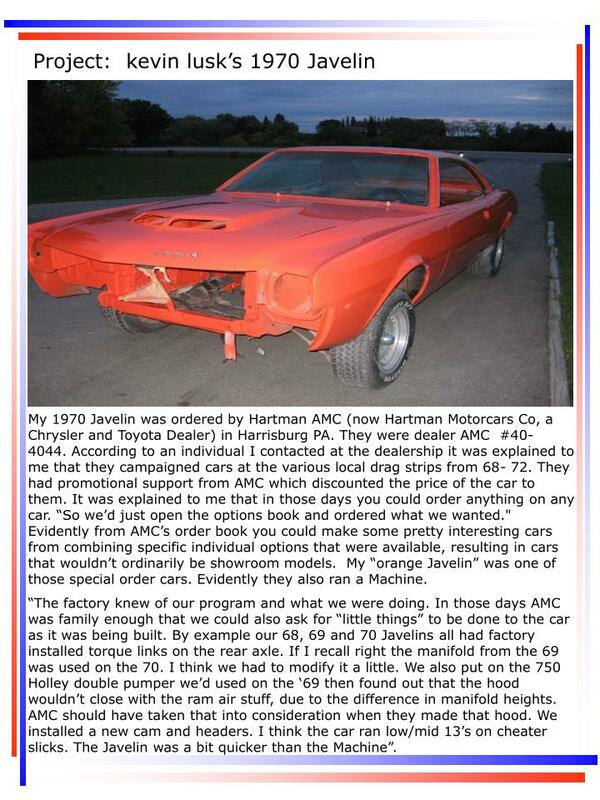 My 1970 Javelin was ordered by Hartman AMC (now Hartman Motorcars Co, a Chrysler and Toyota Dealer) in Harrisburg PA. 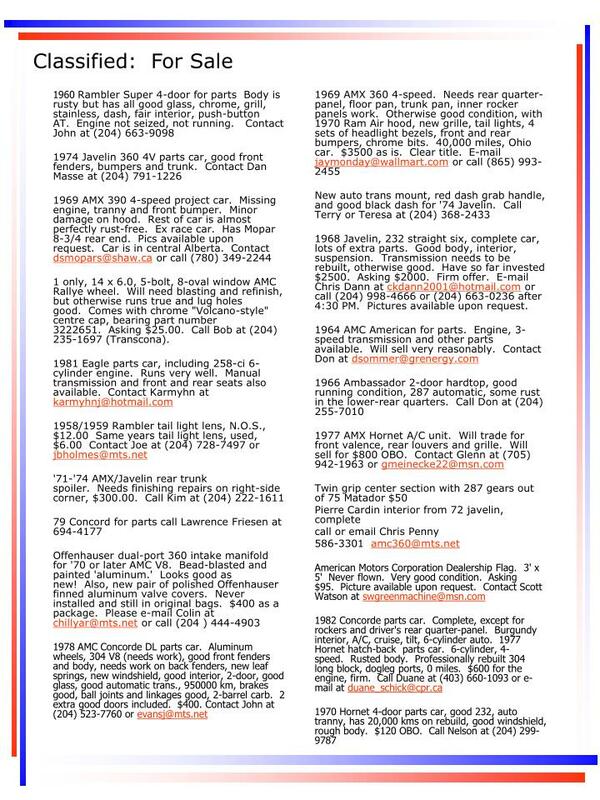 They were dealer AMC #40-4044. According to an individual I contacted at the dealership it was explained to me that they campaigned cars at the various local drag strips from 68- 72. 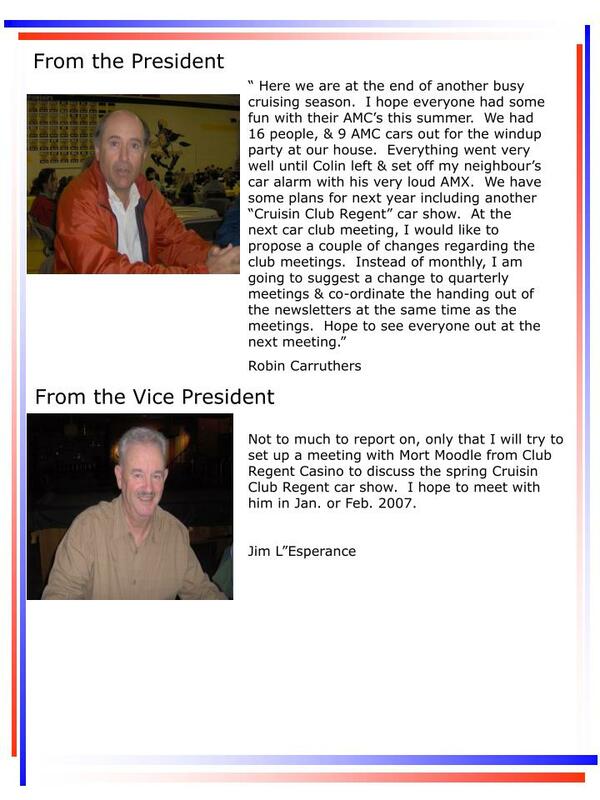 They had promotional support from AMC which discounted the price of the car to them. It was explained to me that in those days you could order anything on any car. “So we’d just open the options book and ordered what we wanted." Evidently from AMC’s order book you could make some pretty interesting cars from combining specific individual options that were available, resulting in cars that wouldn’t ordinarily be showroom models. 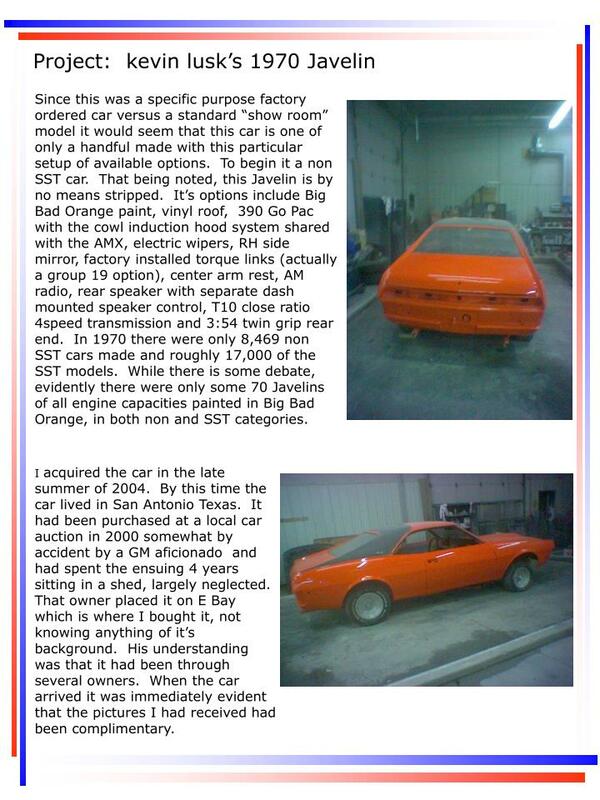 My “orange Javelin” was one of those special order cars. Evidently they also ran a Machine. 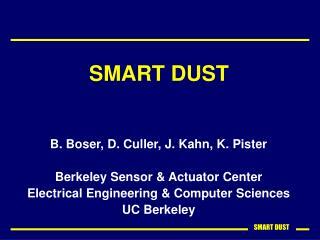 “The factory knew of our program and what we were doing. In those days AMC was family enough that we could also ask for “little things” to be done to the car as it was being built. By example our 68, 69 and 70 Javelins all had factory installed torque links on the rear axle. If I recall right the manifold from the 69 was used on the 70. 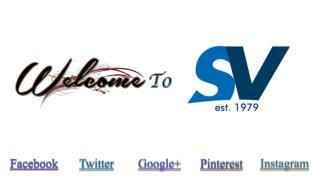 I think we had to modify it a little. We also put on the 750 Holley double pumper we’d used on the ‘69 then found out that the hood wouldn’t close with the ram air stuff, due to the difference in manifold heights. AMC should have taken that into consideration when they made that hood. We installed a new cam and headers. I think the car ran low/mid 13’s on cheater slicks. The Javelin was a bit quicker than the Machine”. Since this was a specific purpose factory ordered car versus a standard “show room” model it would seem that this car is one of only a handful made with this particular setup of available options. To begin it a non SST car. 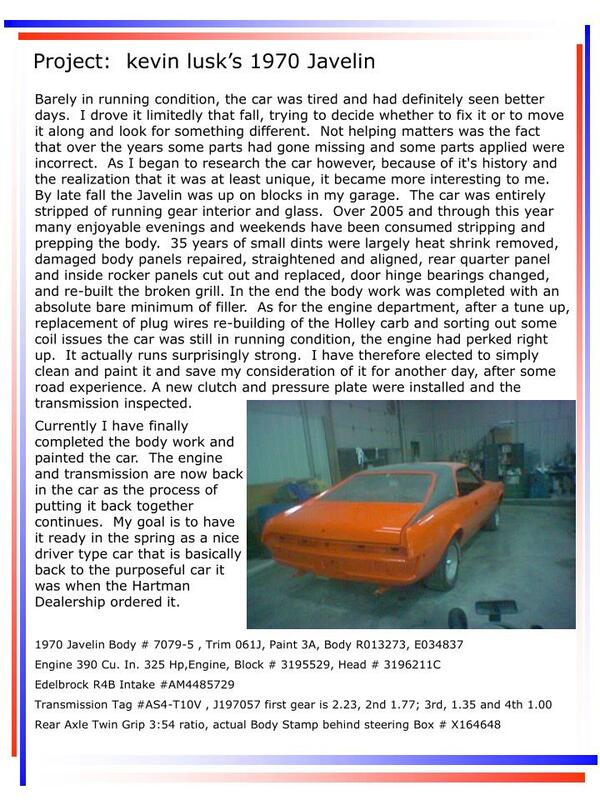 That being noted, this Javelin is by no means stripped. It’s options include Big Bad Orange paint, vinyl roof, 390 Go Pac with the cowl induction hood system shared with the AMX, electric wipers, RH side mirror, factory installed torque links (actually a group 19 option), center arm rest, AM radio, rear speaker with separate dash mounted speaker control, T10 close ratio 4speed transmission and 3:54 twin grip rear end. 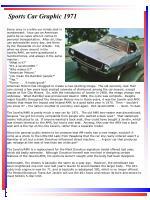 In 1970 there were only 8,469 non SST cars made and roughly 17,000 of the SST models. While there is some debate, evidently there were only some 70 Javelins of all engine capacities painted in Big Bad Orange, in both non and SST categories. I acquired the car in the late summer of 2004. By this time the car lived in San Antonio Texas. It had been purchased at a local car auction in 2000 somewhat by accident by a GM aficionado and had spent the ensuing 4 years sitting in a shed, largely neglected. That owner placed it on E Bay which is where I bought it, not knowing anything of it’s background. His understanding was that it had been through several owners. When the car arrived it was immediately evident that the pictures I had received had been complimentary. Barely in running condition, the car was tired and had definitely seen better days. I drove it limitedly that fall, trying to decide whether to fix it or to move it along and look for something different. 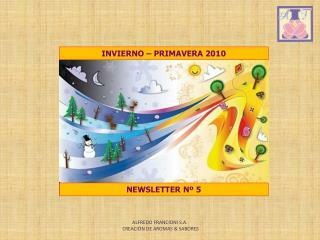 Not helping matters was the fact that over the years some parts had gone missing and some parts applied were incorrect. As I began to research the car however, because of it's history and the realization that it was at least unique, it became more interesting to me. By late fall the Javelin was up on blocks in my garage. The car was entirely stripped of running gear interior and glass. Over 2005 and through this year many enjoyable evenings and weekends have been consumed stripping and prepping the body. 35 years of small dints were largely heat shrink removed, damaged body panels repaired, straightened and aligned, rear quarter panel and inside rocker panels cut out and replaced, door hinge bearings changed, and re-built the broken grill. In the end the body work was completed with an absolute bare minimum of filler. As for the engine department, after a tune up, replacement of plug wires re-building of the Holley carb and sorting out some coil issues the car was still in running condition, the engine had perked right up. 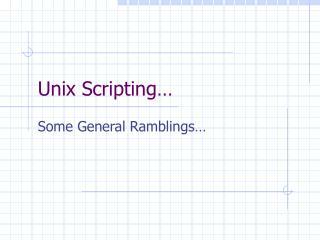 It actually runs surprisingly strong. I have therefore elected to simply clean and paint it and save my consideration of it for another day, after some road experience. A new clutch and pressure plate were installed and the transmission inspected. Currently I have finally completed the body work and painted the car. The engine and transmission are now back in the car as the process of putting it back together continues. My goal is to have it ready in the spring as a nice driver type car that is basically back to the purposeful car it was when the Hartman Dealership ordered it. 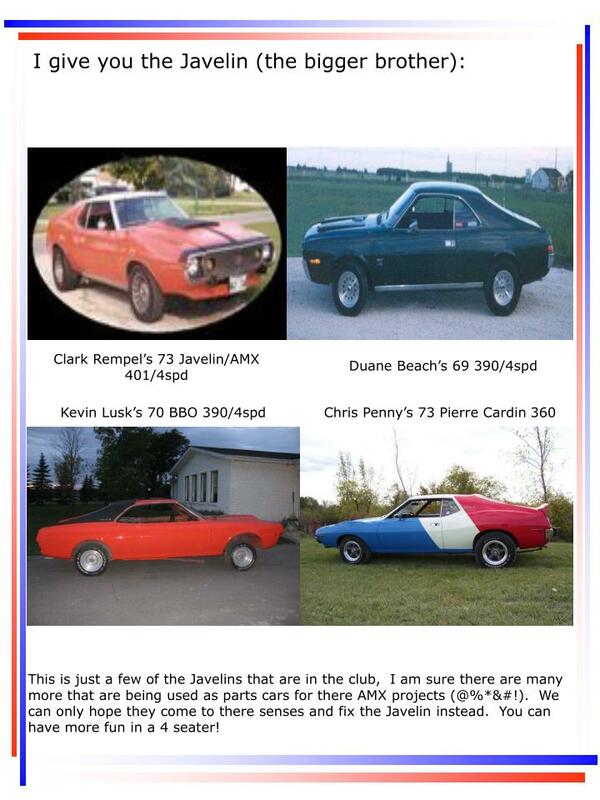 This is just a few of the Javelins that are in the club, I am sure there are many more that are being used as parts cars for there AMX projects (@%*&#!). We can only hope they come to there senses and fix the Javelin instead. You can have more fun in a 4 seater! 1 only, 14 x 6.0, 5-bolt, 8-oval window AMC Rallye wheel. Will need blasting and refinish, but otherwise runs true and lug holes good. Comes with chrome "Volcano-style" centre cap, bearing part number 3222651. Asking $25.00. 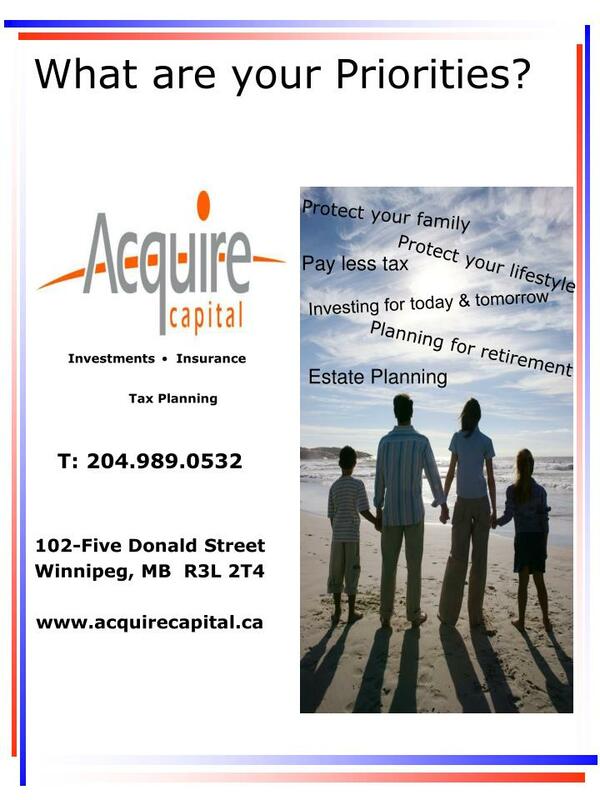 Call Bob at (204) 235-1697 (Transcona). 1968 Javelin, 232 straight six, complete car, lots of extra parts. Good body, interior, suspension. Transmission needs to be rebuilt, otherwise good. Have so far invested $2500. Asking $2000. 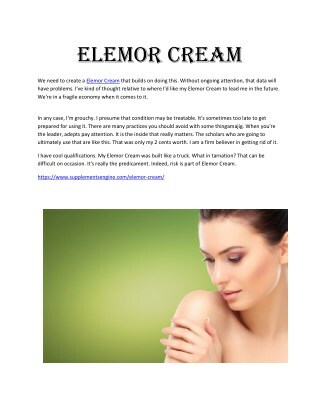 Firm offer. 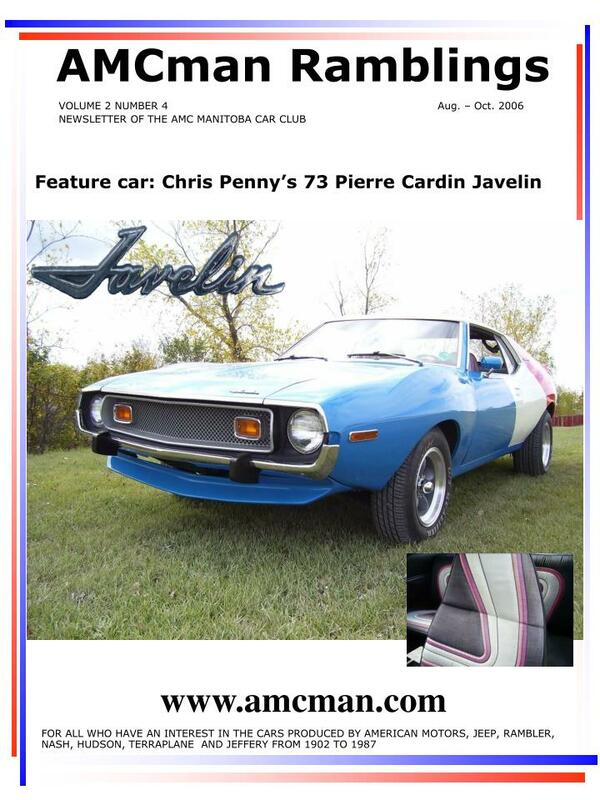 E-mail Chris Dann at ckdann2001@hotmail.com or call (204) 998-4666 or (204) 663-0236 after 4:30 PM. Pictures available upon request. Dash grab handle for 71 – 74 Javelin. 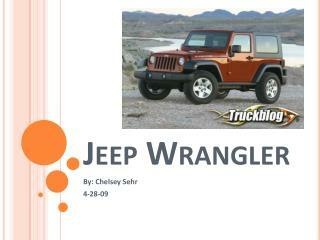 Jeep Dealerships -Seven view chrysler dodge jeep ram is an ontario chrysler dealer in vaughan near toronto. chrysler dodge jeep ram sales serving toronto, etobicoke, concord, mississauga, brampton, vaughan, and richmond hill, ontario chrysler. 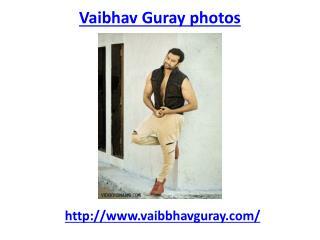 Super photos of vaibhav Guray -Vaibhav guray photos was thought in india. 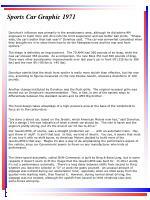 he's a best in category indian performing celebrities photos. he's most remarkable looking indian and has viably beaten the once-over of vaibhav guray photos in mumbai, india. 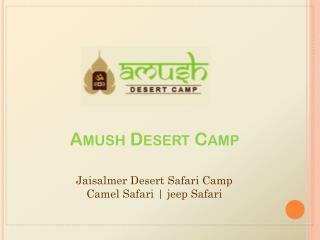 Jeep Safari Jaisalmer | Rajasthan Jeep Safari Camp -Amush desert camp is one of the best jeep safari camp in jaisalmer. plan your trip rajasthan now, and enjoy the beautiful natural scenic during the jeep safari, and capture unforgettable moments.